With 30 years of marketing and branding experience, InnovativeWebPages can research your keywords and optimize your site based on the most searched keywords in your industry and drive relevant traffic to your site. 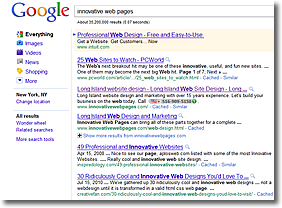 “How can I be listed on the first page in search engines?” Questions we’re asked all the time. Fact is, competition for that first page is tremendously high, all dependent on your business and area of interest. If you’re the only vendor selling a one-of-a-kind product within a certain area, you probably won’t need much in the way of SEO. But if you’re in the orange business in Florida, then you have plenty of people vying for the same spot you are. Optimize each page, including title, Meta Tags, filename and keyword density. Include labels on all images and graphics, pertaining to these keywords. Perform a Google Site Map Generator for proper site indexing. Search Engine Marketing is paid placement on certain pages. Google offers both top and side placement for a variety of price options. Call today for a free consultation – 516-909-5150, or contact us by email here. *cost and results from basic SEO inclusions may vary from business to marketplace.